All consumers of information need to be able to distinguish fact from opinion and recognize any bias, including one’s own, that may influence the quality or depth of understanding what we are reading or hearing. For this reason, these skills are staples of the language arts and social studies curricula. Yet, with new forms of misinformation emerging, parents, educators, and policy makers are asking: do current school curricula and teaching provide an adequate defense against the onslaught of misleading, unsubstantiated, or fake news? Encountering unreliable or just plain false information and even having it impact the national political agenda is not a new phenomenon (e.g., “yellow journalism” of the late 1880’s). Historians point out that “fake news,” a recent term for fictitious claims and “evidence” created to mislead intentionally, can be documented as early as the first printing press. So why does it seem so alarming now? First of all, communications are more rapid, more out there, more instantly available to more people, and less and less filtered. Additionally and unfortunately, more misinformation crafted for malicious or nefarious reasons is making its way onto social media sites and into public discourse. A study conducted recently by a Stanford University professor found that young people’s abilities to reason about information found on the Internet can be summed up in one word: bleak. He found that while these “digital natives” are able to move between Facebook and Twitter while simultaneously uploading a “selfie” and texting a friend, when it comes to evaluating information on social media channels, they are easily duped. 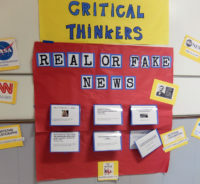 According to the study, regular practice with reading, analyzing, and evaluating information may be the best defense against sinking into misinformation bogs, which means that rather than teaching the skills and moving on, teachers need to provide daily opportunities for students to think about and evaluate information harvested from a variety of sources. Beyond just practice with information, students learn to recognize and work with their own vulnerabilities. For example, a noted side effect of universal access to information is a human tendency to embrace information that reinforces our existing beliefs. Just how prepared are schools and teachers to help students tackle a torrent of information in multiple formats in a more systematic and relentless way? What tools do they have? College and Career Readiness Standards. As it turns out, English language arts, social studies, and science teachers already have basic tools and strategies in the standards adopted and implemented in many states in recent years. These curricula promote argument as the seminal mode of discourse to prepare students for college level studies and for the workplace. When well implemented, argumentation can also provide a buttress against misinformation. By reading and writing arguments, questioning, thinking critically, and evaluating evidence, students are developing the fundamentals to defend themselves against misinformation in all of its forms. More Opportunity. We have already written here about the prominent and significant place of reading and writing arguments in a sound education. What needs to be added is the importance of more frequent occasions for students to apply their critical thinking and argumentative discourse skills to information that they are encountering daily. As the Stanford study finds, the volume of information that students encounter means they need more time to question systematically what they see and read. One may well ask about where to add more time in a crowded instructional schedule. But if teachers of all disciplines, including math and science, provide students with news and information source material from their respective disciplines and help them analyze using the principles and praxis of their disciplines, such as the rules of evidence and proof, students will gain not only more time to practice critical thinking and evaluation, but also a greater variety of tools and the confidence to use them. Librarians. Students and teachers have some determined and formidable allies in the form of professional librarians. Public, local school, and university librarians, who have always considered the defense of credible, trustworthy, and well documented information their primary calling, are pulling together, and posting many of their resources and services for teachers and students, as well as for parents and the general public. The American Library Association promotes a heuristic developed, and recently updated, by California State University, Chico. Known under the acronym CRAAP, it helps students address currency, relevance, authority, accuracy, and purpose in the information they encounter. For each of these traits, there are questions that students and other consumers of information can ask themselves in relation to the information they are reading and using. Why should schools vigorously address media-sourced information with students? Even if political heat around this topic recedes, which doesn’t appear likely, allowing unsubstantiated or biased information to stand unchallenged is harmful in itself. People may believe it and act on it, in some cases harming themselves or others. They may also come to distrust and/or disregard authentic information needed to carry out their civic duties as informed citizens, thereby harming our democracy. More immediately for students, their own reputations or grades can suffer by letting their research or work product fall prey to questionable evidence. With so much at stake, we need to help students develop and practice the requisite knowledge and skills to recognize and fight back against the proliferation of fake news. And schools—with their communities of teachers, librarians, and parents—are our first line of defense. This blog post was also published in volume 99, issue 3 of Phi Delta Kappan.